A couple of days ago, the Guardian’s @datastore announced that a spreadsheet of UK MPs’ (Members of Parliament) expenses had been posted to the Guardian OpenPlatform datastore on Google Spreadsheets. Again, mousing over any of the blocks identifies the name of the MP making that claim. As with the other visulisations, mouse over any point to see which MP it belongs to. By the by, along the way I did a couple of other Yahoo pipes – one to extract expenses by MP name, (which simply pulls in CSV from the spreadsheet, then filters on an MP’s surname), the other MPs’ expenses by postcode. The latter pipe actually embeds the foemer, and works by looking up the name of the MP by postcode, using the TheyWorkForYou API; this name is then passed in to an embedded ‘expenses by name’ pipe. No fair… Okay – so where to get the location data for each MP. Well, the TheyWorkForYou API came to my rescue again. One call (to getConstituencies) pulled out details of each constituency, which included the lat/long geo-coordinated of the ‘centre’ of each constituency (along with the co-ordinates of the bounding box round each constituency… maybe I’ll use those another time ;-) A second call (to getMPs) pulled out all the MPs, and their constituencies. Loading both sets of data into different sheets on Dabble DB, meant I could then link them together by constituency name (for more on linking data in Dabble DB, see Mash/Combining Data from Three Separate Sources Using Dabble DB and Using Dabble DB in an Online Mashup Context). Adding the MP data into Dabble DB after a further bit of cleaning – removing things like Mr, Miss, and Sir from the firstnames etc – and linking by MP name meant that I could now generate a single data view that exposed MPs by name, constituency, and expense claims, along with the geolocation of the midpoint of their constituency. In that first map, the only expenses data I was exposing, and mapping, was the total travel expenses claimed. So over a coffee this afternoon, I created a richer view, and tweaked the map code to let me inspect a couple of other data sets. 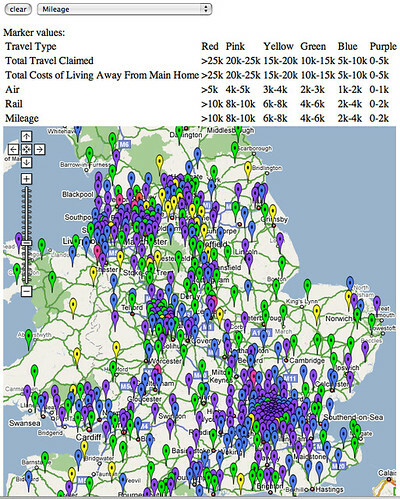 You can find the map here: MPs’ travel expenses map. 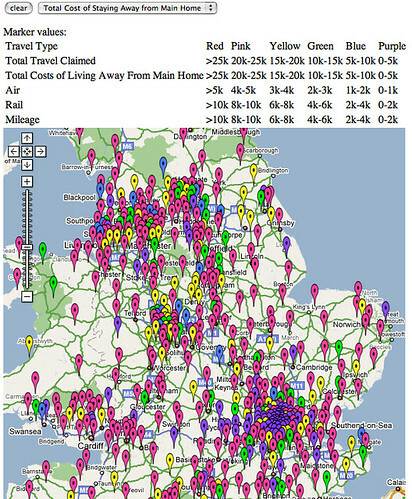 It’s also interesting to use the map based displays in conjunction with other chart based visualisations, such as the MPs’ expenses visualisations on Many Eyes Wikified, to explore the data in a far more natural way than trying to make sense of a spreadsheet containing the MPs’ expenses data. Very nice! Are you charging them yet? I was half-way doing something similar, but you’ve beaten me to it. One trick I was going to use, which might be helpful: the TheyWorkForYou API call to ‘getConstituencies’ also lets you ask for all constituencies within X kilometres of a given long/lat. 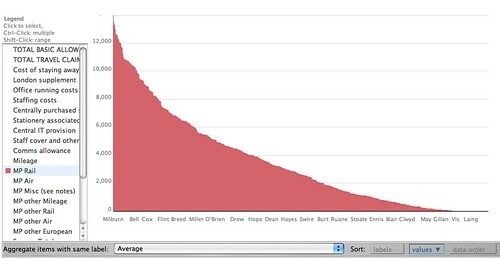 Even better, it returns the distance from that long/lat point in the results. 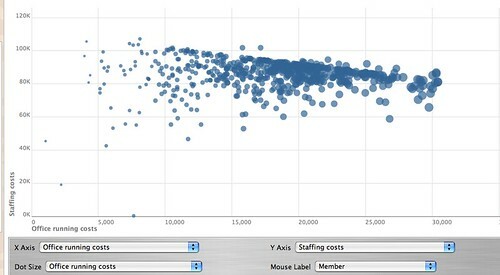 @simon It would be interesting to just pop that distance vs expenses data onto a scatter plot (and do the same for eg mileage and/or rail data)? 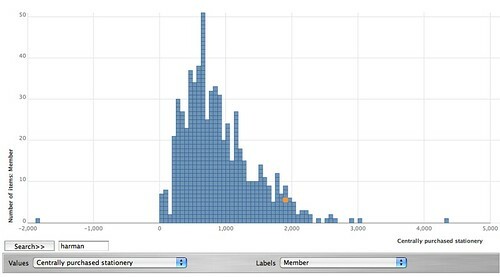 …but it would maybe help normalise the data in terms of eg. somewhere up north being a similar ditance away from London as somewhere south west… and it may also identify different travel costs if eg similar distances but from different parts of the country have different expenses associated with them? I guess the map way of displaying this would be to plot concentric circles over the map, centred on Westminster? I think that’s exactly right, Tony. A simple distance-to-cost calculation won’t answer anything directly – but it would ask a few interesting questions anyway. Awe inspiring. Really, I am inspired. How can we make this easier for anyone else to do? It would be nice to relate expenses claimed to the usefulness/effectiveness of the MP! For example, expenses against speeches made, bills proposed or votes cast. This way the taxpayer can judge value for money spent. Not sure how to get hold of the data to do this. Pingback: Sunlight, process, systems, moats, tennis courts, flipping, heatmaps, mashups and flat screen TVs. Good work, we have done some work on the MPs’ Expenses data and are looking to aggregate it with other data sets. I thought you might be interested in OpenPSI ( http://www.openpsi.org ), a collaboration between the University of Southampton and the UK government, lead by the National Archive, to trial a new form of community provisioned information service. We are exposing UK government data using the Semantic Web standards, RDF. We have SPARQL end point so data mashups can be created by issuing query requests. As well as providing some data sources, we are trying to spark interaction between government information providers, academic researchers and information intermediaries, specifically to bridge the gap between those researchers who may not have all the technical skills or data knowledge to answer important research questions.